And I’m guessing that Robert isn’t the first Formula 1 Driver to take part in Rallying - besides thee REAL Iceman; Err ‘Kimster, nee Kimi Räikkönen and his OOMPHLatt’s; Hya! Thinking what could go wrong in a Tin Top? Yet Rallying, like ALL forms of Motorsports is a violent sport which seems to have had its share of Star driver’s deaths occurring - with just a few WRC members listed below over the past decade. Richard Burns – Nov 25, 2005; Age 34 dies from Cancer. Colin McRae – Sept 15, 2007; Age 39 dies in Helicopter crash. Thus I subsequently pilfered out that thee ‘Krakow Kid” was behind the wheel of a Skoda Fabia S2000 Rally Car that fateful day last February, and after my initial thoughts - where I seemed to be the only ‘Hack to scribble how much Kubica’s accident injuries made me immediately think of another ex-Formula 1 driver named Alessandro Nannini, who severed his hand in a Helicopter accident and never-ever raced again in F1! Yet with more time to reflect, I’ve pondered what nobody seems to have wondered? 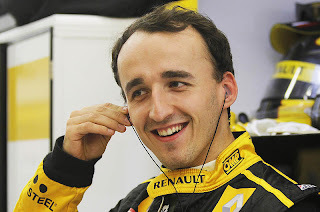 As in were Kubica’s horrific injuries in anyway related to the type of Rally Car he was piloting, a Super 2000-spec vehicle, which I believe are much smaller then the previous WRC chassis, and hence, are they potentially more dangerous to driver’s health? And has the WRC simply dodged a bullet so far? Or was Robert’s accident simply due to striking a solitary wall at a high rate of speed which regardless of what type of Rally Car wouldn’t have mattered? Where the likeable Brazilian’s spirit was further CRUSHED by Scuderia Ferrari asking Felipe’s Engineer Rob snedly to inform Massa that “Fernando is FASTER then you - can you confirm, please!” You know when Stefano Domenicali ordered Massa to let “Ferdi-the-Putz,” nee Fernando Alonso to pass him for the lead at the 2010 German GP; SHEISA! And with Kubica falling on ice and re-breaking his leg a few months ago whilst trying to rehabilitate himself, we’ll simply have to wait ‘N see if the Pole does ever return to F1? Not to mention, who would he drive for? As I fear Kubica will become another unfortunate Open Wheel Racing Star falling in the shadows of ‘Sandro and ‘Shorty, a.k.a. Nannini and Cristiano da Matta respectively, although Da Matta and Nannini, along with Alex Zanardi all did recover and further raced in Touring & Sports Cars; as although its overly cliché - at least they all did ultimately walk away!